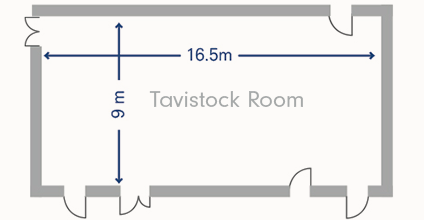 The Tavistock Room can be the perfect space for conferences and presentations for up to 120 people. Alternatively, it serves as a fantastic space for networking refreshments and exhibitions or pre dinner drinks for events taking place in the Woburn Hall. Located just a single flight of stairs from the Woburn Hall, the room is flexible and suitable for setting up in a variety of styles including theatre, cabaret and boardroom layouts. The room comes with a glass whiteboard, flipchart and HD LCD projector included with the option of hiring a PA system with microphones and laptop for those all important presentations. Catering can be provided at the back of the room which is 16.5 x 9 (LxW) in size. Read more about our AV services.